It turns out most kids don’t turn down edamame and carrots—especially with a bit of ranch dressing! I was interested in seeing whether the kids had much of an interest in the salad bar. While I admit the other parent and I had to lure them over, all kids who approached happily took edamame and/or carrots with a side of ranch dressing. These were the only bins that needed replenishing (more than once)! Sure, a handful of kids took other items here and there, but none of the other offerings could compete with the edamame and carrots! I wasn’t too sure how an entirely veggie sandwich would go over with my boys, but I was pleasantly surprised! My four-year-old ate this right up! And my first grader, well, let’s just say I’m just pleased when he eats a few cooked carrots! 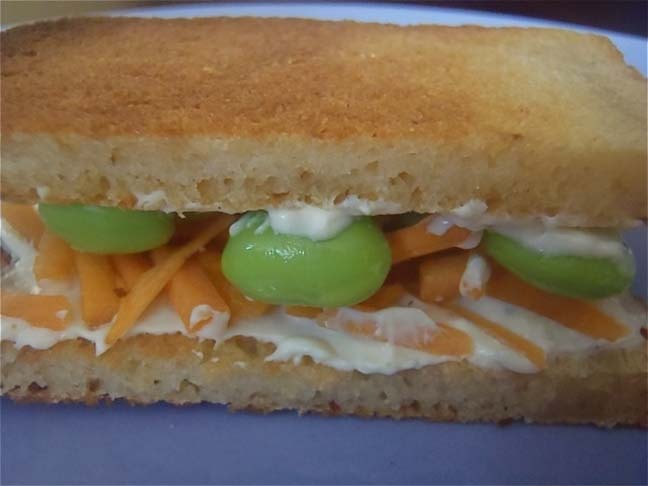 Keep reading to see how I made this edamame sandwich with carrots and ranch dressing for my kids. Step 1: In a tiny mixing bowl, combine the cream cheese with the dressing. Step 2: Spread half of this mixture on the surface of each slice of bread. 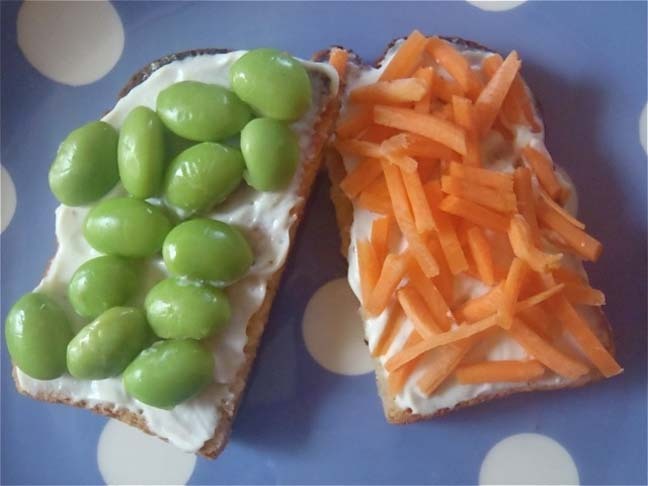 Step 3: Place the carrots and edamame on top of one slice and place the other one on top. Delicious! Some additional notes: You can purchase carrots already grated to save time. For a sandwich, it's much nicer to have little pieces of carrot, rather than large chunks. I love toasted bread for sandwiches, but for a lunch box I prefer "untoasted" bread, as toasted bread may become very hard after a couple hours.